Whether your commercial business has a flat roof, needs shingles, metal, cedar, slate or a tile covering, Les Jones Roofing provides you with quality solutions. With the knowledge gained from years of experience, we are ready to meet any challenges sent our way. On many flat roofs we generally use Firestone EPDM (rubber) roofing membranes for long-lasting quality. 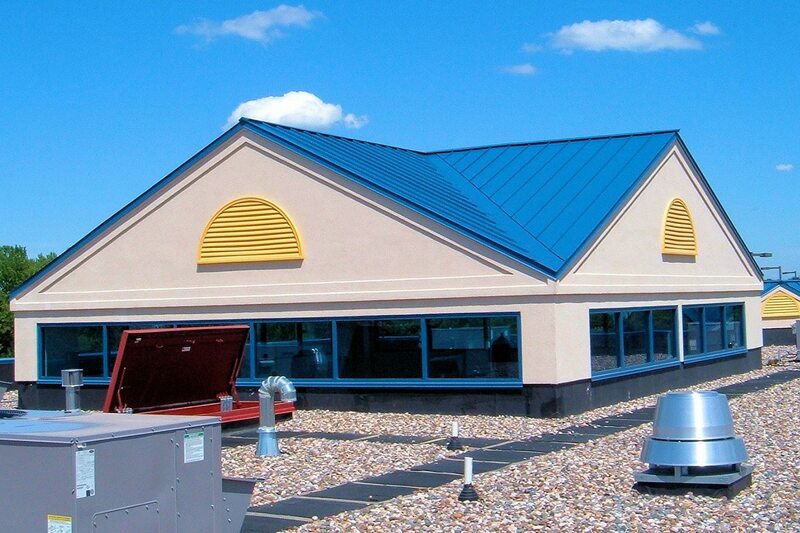 We also handle sloped commercial buildings with a variety of unique options from shingles to standing seam metal roofing systems. As a building owner or a customer with a vested interest in a townhouse association, you can be sure that we will take care of all your commercial roofing needs. We also protect your investment by offering regular maintenance programs to help prevent any leaks or costly repairs on your existing roof. So how experienced is Les Jones Roofing? Just look around the Twin Cities to see examples of commercial buildings we’ve worked on, including: Coca-Cola, General Mills, Holiday Inn, Holiday Service Stations, Red Lobster, Culver’s Restaurant and Salvation Army to name a few.